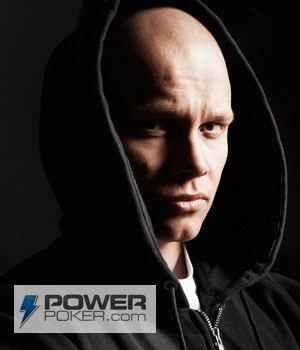 The "Ilari FIN" account on Pokerstars belongs to none other than online high stakes cash game legend, Ilari Sahamies. The name Ilari Sahamies should ring a bell, as he is the player behind the infamous "Ziigmund" account on Full Tilt Poker. The "Ilari FIN" alias is obviously a combination of his first name and the fact that Sahamies hails from Finland. Ilari "Ilari FIN" Sahamies is known for his aggressive play and short temper. Sahamies is generally well-liked by fellow high stakes pros, but he has been known to blow a gasket and curse everyone out when things are not going his way. Sahamies has had a couple of online confrontations with Danish poker star, Gus Hansen. Ilari Sahamies has enjoyed a great deal of success in the online high stakes cash games. According to various tracking sites, Sahamies is currently up approximately $1.3 million under his "Ziigmund" account on Full Tilt Poker, while he is down approximately $43,000 playing as "Ilari FIN" on Pokerstars. Due to his ultra-aggressive style, Sahamies has some monumental upswings and downswings. One week Sahamies could make $3 million, and the next week he could lose $2.5 million. That is just the way that he plays. Sahamies' game of choice is most certainly Pot Limit Omaha, as it lends itself well to his aggressive style of play. "Ilari FIN" doesn't like to sit around and passively wait for premium hands - instead, he prefers to play practically every pot. Through his ultra-aggressive style of play and humorous antics, Ilari "Ilari FIN" Sahamies has been able to build a fairly large following. This following has earned Sahamies a sponsorship deal (he is currently the face of PowerPoker.com) and multiple television appearances. Although Sahamies was fairly subdued on "Poker After Dark", he is known to get very aggressive and rambunctious in live cash games when he has been drinking.